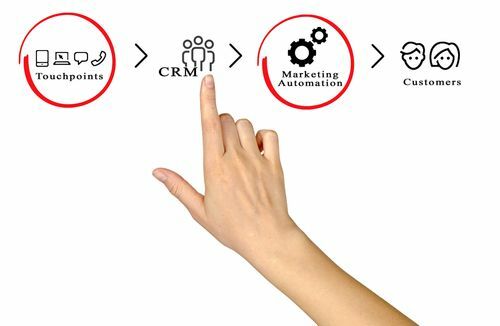 Marketing automation software and CRM (customer relationship management) systems perform similar functions but have two very different purposes. CRM is primarily used for sales strategies and managing direct communications with both potential and current customers. Marketing automation software is used to streamline, automate, and measure the effectiveness of marketing campaigns. Both systems store key information about customers; their names, email addresses, phone numbers, etc. That, however, is where the similarities of these two systems really end. Marketing automation is used to record the initial contact of a prospect. With it, you can follow when they visit your site, read a blog post, open a marketing email, or fill out of form. It is used by marketers to measure the effectiveness of email campaigns and other marketing efforts. Marketing automation makes it easier for you to categorize prospects based on their interests. It helps you tailor future communications with your prospects based on their initial contact with your company. It also provides useful data to analyze what worked in your marketing campaign and evaluate what areas would benefit from a different approach. CRM helps with developing long-term customer relationships. It stores information like, how long someone has been a customer, purchasing activity, and how many times they have reached out to your company via email or phone. It is beneficial to salespeople because it provides a detailed history of each customer. This gives salespeople the ability to provide a more personal experience to customers and increases the likelihood they will remain loyal to your business. CRM systems can also send reminders to your sales department when a customer’s account is scheduled for renewal, they have an upcoming birthday, or some other special anniversary. Most companies begin with CRM systems to help them close more sales and improve customer loyalty. If you are in the mortgage industry, you may be able to find a CRM like MyCRMDashboard that has a hands-free marketing engine built right in. Here’s a good article about what to look for when choosing a CRM.